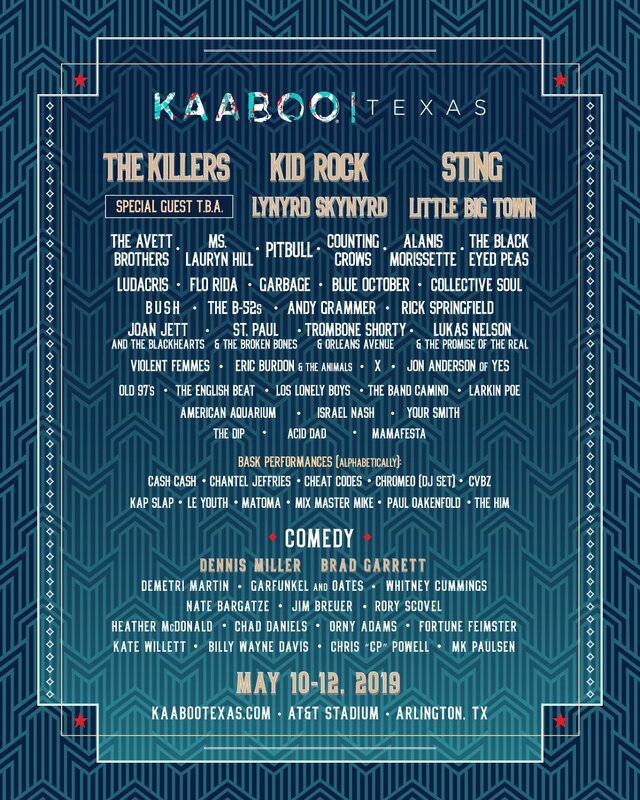 KAABOO Texas festival at the AT&T Stadium in Arlington, Texas from May 10 - 12, 2019. More information at kaabootexas.com, or direct link to buy tickets. KAABOO is everything a typical music festival is not. That's because we're not a "festival". we're a new kind of entertainment and arts experience designed around comfort, hospitality and good times. You shouldn’t have to sacrifice comfort for great live music, and at KAABOO , you won’t. Forget what you know about music festivals, we’ve shifted the paradigm and built something new. KAABOO is the perfect weekend escape, described in a word that comes from whatever the hell we feel like yelling when we’re high on life and having fun. A curated three-day sound voyage that combines rock-n-roll music and tastemaking events in a modern wonderland at the world-class AT&T Stadium. Where every detail is designed for your enjoyment and clean, comfortable amenities inspire you to break from your busy life, let loose and enjoy the experience. Welcome to KAABOO, the place where all of your senses align. The main music acts are: The Killers, Kid Rock, Sting, Lynyrd Skynyrd, and Little Big Town. Other notable music acts include: The Avett Brothers, Ms. Lauryn Hill, Pitbull, Counting Crows, Alanis Morissette, The Black Eyed Peas, Ludacris, Flo Rida, Garbage, Blue October, Collective Soul, Bush, The B-52s, Andy Grammer, Rick Springfield, Joan Jett and the Blackhearts, St. Paul & The Broken Bones, Trombone Shorty & Orleans Avenue, Lukas Nelson & The Promise Of The Real, Violent Femmes, Eric Burdon & The Animas, X, Jon Anderson of Yes, Old 97's, The English Beat, Los Lonely Boys, The Band Camino, Larkin Poe, American Aquarium, Israel Nash, Your Smiht, The Dip, Acid Dad, and Mamafesta. Cash Cash, Chantel Jeffries, Cheat Codes, Chromeo (DJ Set), CVBZ, Kap Slap, Le Youth, Matoma, Mix Master Mike, Paul Oakenfold, and The Him. Dennis Miller, brad Garrett, Demetri Martin, Garfunkel and Oates, Brad Garrett, Whitney Cummings, Rory Scovel, Jim Breur, Rory Scovel, Heather McDonald, Chad Daniels, Orny Adams, Fortune Feimster, Kate Willett, Billy Wayne Davis, Chris 'CP' Powell, and MK Paulsen.